According to the New York School of Anesthesia, a femoral nerve block is a “basic nerve block technique that is easy to master, carries a low risk of complications, and has a significant clinical applicability for surgical anesthesia and post-operative pain management. It is well suited for surgery such on the anterior thigh, knee, quadriceps tendon repair, and postoperative pain management after femur and knee surgery". When combined with a block of the sciatic nerve, anesthesia of almost the entire lower extremity from the mid-thigh level can be achieved. The success rate of this block for surgery is very high, nearing 95%. This type of block results in anesthesia of the entire anterior thigh and most of the femur and knee joint. The block also confers anesthesia of the skin on the medial (inner) aspect of the leg below the knee joint. 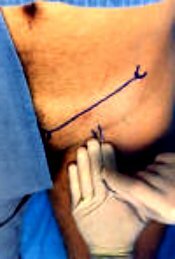 The femoral nerve block is performed under local anesthesia. 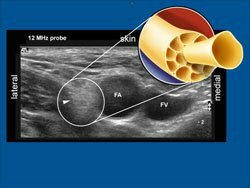 Localization and identification of the nerve can is typically accomplished through the use of an ultrasound for needle guidance, and electrical nerve stimulation to verify proper needle placement before administering the anesthetic agent. This can be performed as a “one-shot” application, or by inserting a catheter and maintaining it for a few days to provide prolonged anesthesia/pain relief. Are there side effects and/or risks? With any procedure there are risks, side effects, and possibility of complications. The most common side effect is leg numbness and weakness which will impair your ability to stand and walk. You will need assistance with weight bearing activities until all numbness and weakness is resolved. your leg will be weak. Risks also include infection, bleeding, and puncture of a blood vessel. Because of the increased risk of falling, ambulation, while under the influence of the block, walking (typically with a walker) should be done with assistance, such as the Physical Therapist or Nurse.